Good Ferret Treats or Snacks – Which Treats are Safe to Give? Q: What are Some Good, Healthy Treats to Feed my Ferrets? A: Good ferret treats are made with Meat. Choose treats that contain 1-2 meat ingredients, with no grains, by-products, artificial colors, flavors, or preservatives, and a binding agent from animal bone. The thing with treats, is to remember, they are just that… a TREAT. Personally, I work on the principle that as long as it is not physically bad for them, like Raisins, Chocolate, or hard vegetables, nuts or fruits then giving them a little of what they fancy, helps create the bond between you and them. Imagine in your life never having an Ice Cream, or a piece of Chocolate. Yes you would live, and be healthy, but you would have missed out on some of life’s greatest pleasures. The adage I always use is the one about the Guy who gave up Wine women and song as he heard he would live longer with out them. Did he live longer? Who knows, but boy did it feel like he did! N-bones. One word of thought though. I only give these in plain sight. It may be me being parinoid but some of my oldsters have had trouble with them getting stuck in roof of mouth. So I want to be there to help if needed. Wysong – Pheasant and Chicken Dream Treats. Nutri-cal – I use this VERY sparingly, but I do keep it around. Ferret-tone – This is a must at our House!!! and Occasionally cooked up beef, chicken, liver, or other goodies. Give chicken baby food as a treat, so they get the ferret used to it. It’s good to get them onto that so in case they become sick and won’t eat anything else. They also go nuts for peanut butter (pun intended) ;D, though they only get a little lick every now and then. Same with ice cream or yogurt. I give my two N-Bones (Chicken Flavored) and Foamy Fries. You can get them both at Petco and are pretty inexpensive. They are excellent for their teeth and helping with the plaque. The Foamy Fries (okay, they are actually called Super Fries) are a foamy like substance and smell like the old candy Bit-O-Honey but are sugar free (which is a good thing). And my little girl, Lucy, loves the Bandits Chicken Treats. 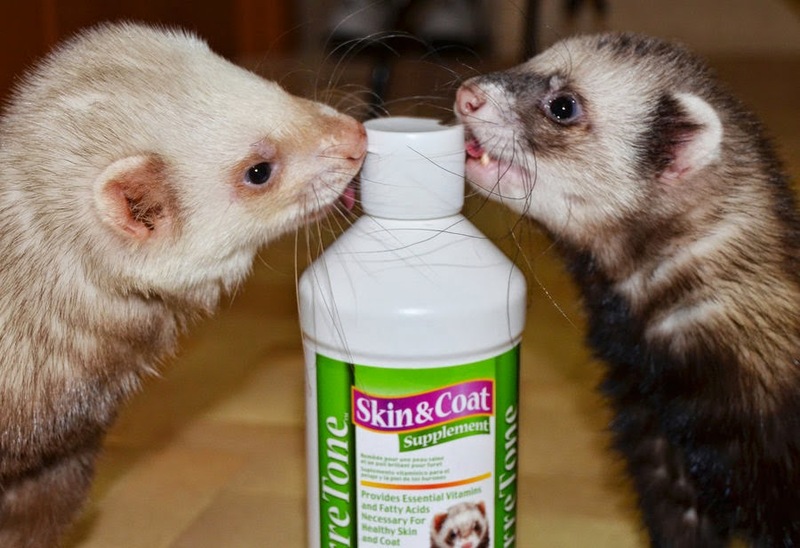 Ferretone is listed to help their skin and coat, but for a lot of us it is used as a treat OR used when we clip the ferrets nails. you put a squirt of it on their belly and while they are licking away at it, they seem to not notice that you are clipping their nails. I have not used Fur-O-Tone, so i dont know if the taste of it is the same as 8-1 ferretone. might be something to think about… try the ferretone and see if they like it more. Our ferrets beg for it. and they know if i am sitting on the floor with my legs laid out flat, that its nail clipping time and they fight over who is first. ;D who would have thought nail clipping could be so easy. So make your own mind up and if you do decide you want to use them, just make sure you keep them to small infrequent treats and remember they are not a food substitute. I’ve never fed them, but I’d prefer a treat that uses animal protein vs soy. It also has some starches in it (sugars) and uses Rosemary extract as maybe a preservative or antioxidant (rumors that it is a neurotoxin). Someone that reviewed the product on ferret.com claims they are more nutritious than Nbones… While I haven’t really looked too much into these and am not endorsing nor doubting this person, I thought I’d throw that into the realm of possibility. I bought a 3.5 oz container of peanut butter flavor Yogies! treats but my ferret doesn’t like them. I opened the container this week and took one out so they are brand new. But the first ingredient in Yogies is sugar (which means its the largest amount of anything in the whole product). 4th ingredient is dextrose – more sugar. Canola oil isnt even good for humans… There have been studies that show that there are serious effects on rats and pigs. Canola oil comes from genetically engineered rapeseed oil, which is part of the mustard family. Some places actually say its TOXIC to human and animals – which makes sense because its an excellent INSECT REPELLENT. The seed it comes from in a non-engineered form is an industrial oil, not food oil and its suppose to be pretty nasty stuff. Canola means “Canadian Oil” – its still rapeseed oil, just with another name. Now, I’m not sure whether ALL of this is true or not… but I’d rather not risk it personally. There are several other alternative oils to try… as mentioned, olive oil (extra virgin is best) – which also makes a great ear cleaner – but also emu oil, or salmon or fish oil. I only ever used Cheweasles on kits who were chewing everything else.. They’re very full of sugars and artificial flavors and colors.. If you’re going to look into chew treats, I would go with Nbones. My group loves them and they’re a lot more healthy..
Cheweasles are okay. However, just from experience, mine never actually chewed on them. Just picked up and hid them with their stash. Seems they are more likely to chew N-bones and Foamy Fries, but just my experience. I find a good way to get a ferret to try a new treat is to cover the treat in either ferretone, vivify, or ferrivite. Eventually they start licking the treat and the idea is eventually come to like the taste of it and eat it. My crew eat a wide variety of treats. 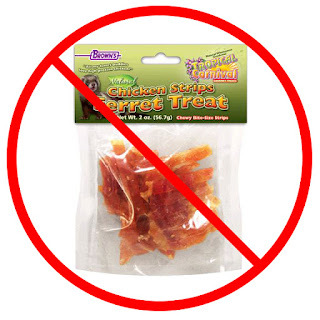 I buy dehydrated meats on ebay to use as treats, their favorites being beef heart, pork steak, and chicken gizzards. Everyone except Penny loves N’bones and everyone loves Vivify. A lot of treats out there claiming to be for ferrets aren’t very good for them and have the potential to be harmful. Watch what you buy and read your labels. Sometimes I try out random dog treats that are 100% meat. I’ve had limited success with lamb lung and different duck and chicken jerkies. As a young ferret owner, I knew that ferrets cannot have fruit/veggies or grains, but Ive noticed that a few of the ferret treats are flavored with that stuff. I hadn’t read ingredients yet, but was wondering to use as a treat other than ferretone (which I have). The only thing I have given him treat wise is the ferretone or small pieces of his food. Ive even cooked chicken for him but he wont take it even though its in the duck soup cubes I give him once in a while. I knew the Bandit treats and Yogurt treats aren’t so good for ferrets because they are high in sugars, but I was wondering how some of the 8 in 1 treats are. I have been feeding them to my ferrets for a while now and haven’t had any issues, but I want to make sure I’m not giving them something that is bad for them. I only give them like 3 or 4 treats each week. Also, if these treats are not technically good for them, I thought it was okay to still give them a few every couple of weeks as long as it is with their normal food (I feed them Zupreem). Can Ferrets Have Treats with Sugar? These little sweeties already get a raw deal by having a naturally short life span…why not let them enjoy some of the enjoyable things ferret life has to offer? My guys LOVE Nbones, foamy fries, and some of those bandits treats. When Amon was still alive he used to love that “fruit and crunchy” canned treat. I took out the raisins, and he got a small pile once a year for his bday. Aphrodite adores dried pineapple peices, and I’ll give her a single peice once a year for xmas or her bday. I know as long as I’m feeding them right, and giving them their play time and keeping them clean, that a sweet wont kill them once in a while.